The crew of Salt Lake Community College’s Black Box Theatre have put on a show centered around physical comedy, fairy-tale themes, and Commedia dell’Arte. 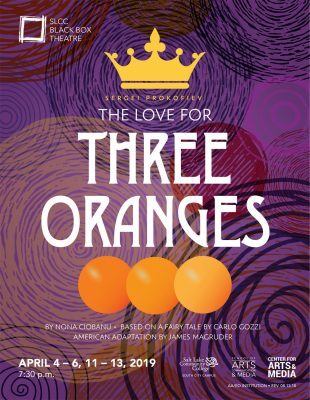 “The Love for Three Oranges,” based off an Italian fairy-tale, is a slap-stick tale about Prince Tartaglia and the people in the royal court. One day, the Prince falls into a deep sorrow and, despite the attempts from everyone in the castle, can’t laugh. He regains the ability only after a witch makes him laugh, but she then curses him to become obsessed with finding three specific oranges, inspiring his quest to get those fruit at any cost. Commedia dell’Arte is a form of 15th century Italian theatre that uses improvised dialogue and colorful stock characters. Stock characters in “The Love for Three Oranges” include the Captain, Harlequin, and Pierrot (The Sad Clown). Other notable characters include the Prince’s father, the King of Clubs; Pantalone, the King’s advisor; and Truffaldino, the Court Jester. Not to mention the traveling chorus of clowns that follow the Prince wherever he goes. “The Love for Three Oranges” is a comedic play that can be enjoyed by people of all ages. At its core, the show itself is more of a piece of children’s theatre, but with its entertaining physical comedy, mature innuendos, and improv, it can be enjoyed by children and adults alike. Curtis is an associate professor of theatre at SLCC. He and the cast have been doing rehearsals for six weeks, along with two weeks of Commedia workshops. The cast has been working hard to juggle work, school, and rehearsals. “The Love for Three Oranges” can be seen in the Black Box Theatre from April 4-6 and 11-13 at 7:30 p.m. A matinée will be held April 13 at 2 p.m. A general admission ticket costs $10; kids receive free admission.